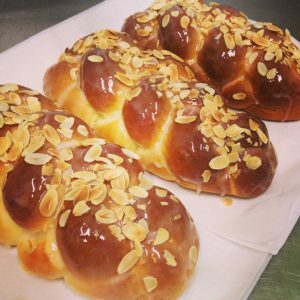 New today are these beautiful Glazed Brioche Braids, our Brioche is made using a traditional French recipe with lots of eggs, butter, and milk. It is soft, and fluffy and has a rich buttery flavor. it is covered in a fondant glaze, toasted almond flakes, and dusting sugar. Perfect for your family morning or afternoon tea, and it is sure to impress when you take it to your next work meeting.